This week we’ve once again been persevering through temperatures in the upper 90s with only the hint of a breeze to ease the day. Tonight, thunderheads gathered on the horizon but remained well south of us. With a four-inch rain deficit now in our area and the hay fields drying brown and crunchy, we scan the skies regularly hoping for some respite from the building clouds. Although there wasn’t any relief this evening, we enjoyed the golden hues of the sun as it slipped behind the Blue Ridge ending yet another wonderful summer day. Beautiful… absolutely!! 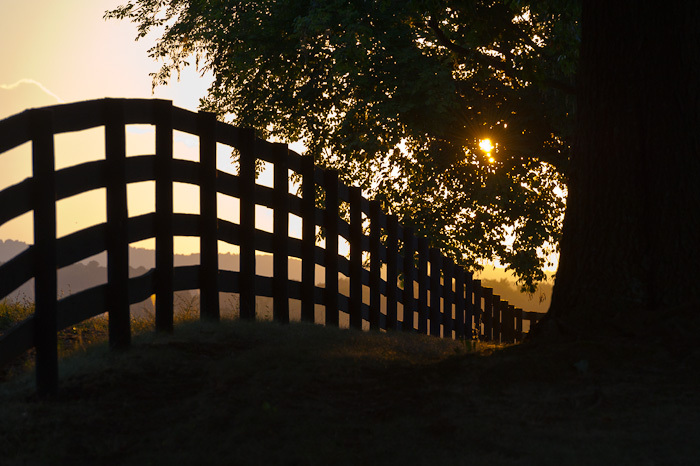 I love the curve in the fence. Thank you so much for your comment and for visiting my blog! Love the composition and the fence leading the eye through the image.. Will send you some Scottish rain – we have had more than our fair share this summer! Thank you! Would love some rain, especially from such a beautiful part of the world. I appreciate your comments and for visiting my blog!